PITTSBURGH, PA – March 13, 2018 – Leech Tishman’s LaunchPad Legal Team is pleased to announce the winners of its Business Pitch Competition. 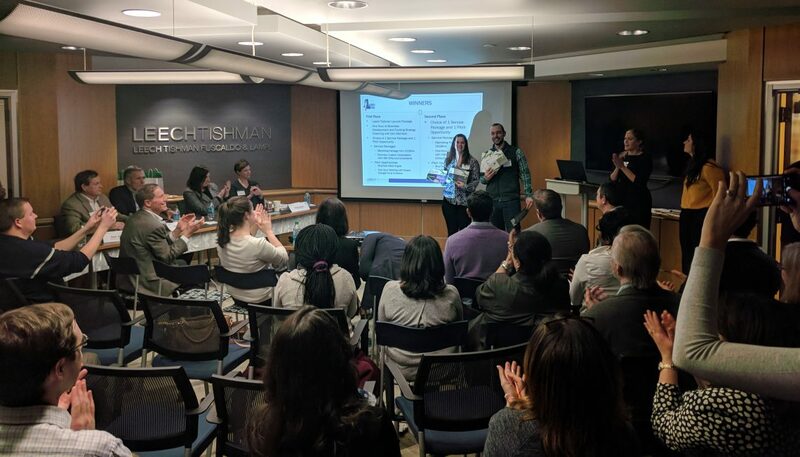 The Business Pitch Competition, hosted by Leech Tishman on March 8, was an event featuring business presentations, networking, resource opportunities, and awards. The Competition was an opportunity for local entrepreneurs and early-stage startups to exhibit their business ideas in front of a panel of judges, made up of local investors, as well as an audience of local business and industry leaders. Velocity Robotics won first place in the competition, and Spand-ICE was runner-up. Two additional awards were granted to Behaivior LLC and The Aquaponics Project. Velocity Robotics (right) won first place in the Business Pitch Competition, and Spand-ICE (left) was runner-up. Velocity Robotics, a pioneer in the Internet of Tools market with their suite of connected power tools, won first place in the Business Pitch Competition. The Grand Prize for the competition was the Leech Tishman LaunchPad Legal Package, which is designed to take one’s business from “pitch” to “reality” by providing the legal services that start-ups need to build an infrastructure that is customized to their goals. In addition, Velocity Robotics won one hour of Business Development and Funding Strategy Coaching with Don Morrison of BlueTree Allied Angel Investors. Spand-ICE, a maker of pain relief products for mothers, was the competition’s runner-up. Two additional awards were given at the competition. Behaivior LLC, which is developing a platform to predict and prevent addition relapses and overdoses using wearables, won the Audience Choice Award, sponsored by Craig-Goodworth & Associates at Merrill Lynch. The Aquaponics Project, which focuses on holistically integrating all aspects of the food system to turn waste into revenue, won the Women in Business Award, sponsored by the Next Act Fund. At the Pitch Competition, a total of eleven startups pitched their ideas to an accomplished panel of judges in front of a crowd gathered at the Leech Tishman office. The seven finalists who presented were Behaivior LLC, Blast Off Apps, Crowdgiftz, Spand-ICE, The Aquaponics Project, Theia Robotics and Velocity Robotics, Inc. The evening also saw four semi-finalists, Dissolves, Mediawala, Noble Regeneration Lab, and Olio di Alessandro, give one-minute pitches to the attendees. The Business Pitch Competition would not have been possible without the support and participation of our wonderful sponsors. We would like to thank the startups, judges, sponsors and attendees for making the Business Pitch Competition a wonderful event! Leech Tishman supports entrepreneurs to help transform their vision into a reality. Our attorneys provide the legal services necessary for creating an infrastructure that assists start-ups in successfully launching from ideas to profitable enterprises. The LaunchPad Legal Team consists of Corporate and Intellectual Property Practice Group attorneys, Frederick C. Leech, Christopher J. Owens, and Francesca M. Schiavone. The LaunchPad Legal Package, which was awarded to one Grand Prize winner during this competition, offers individuals and organizations the legal services that start-ups need to build an infrastructure that is customized to their goals.